Just a reminder … my FREE card & scrap night is on Friday 28 March 2008 from 8.00pm, for any who are interested in coming along. Remember … this is an “up to you” night. It is a night to work on your own creations. You need to bring along your own cardstock, adhesives, embellishments etc and any of your latest purchases you haven’t yet used. You are welcome to also use any of my stamp sets, ink pads or punches, if you like. I will supply a seat, some lollies (perhaps some chocolate Easter eggs if you can stomach the sight of them …) and coffee/tea/cold drinks. Book some time in your diary for YOU now and come along. Bookings essential (simply so I can organise table space for everyone). Have you seen, or do you own, either of these two cards? If you have, it means you have either been one of my hostesses or you have been to a workshop party where I have demonstrated, as these have been my demonstration cards which I give to my hostesses. So! 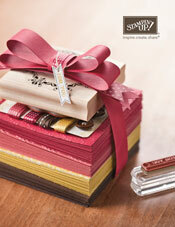 I must now ask you … have you made anything with your Stampin’ Up! purchases? Well, if the answer is no to this question, then it is time you dedicated some time to create … it is time to make time for YOU! I am having a FREE card & scrap night on Friday 28 March 2008 from 8.00pm (the Friday night after Easter) for any of my hostesses, customers or friends (or your friends) who are interested in coming along. It will be a night to work on your own creations. You simply need to bring along your own cardstock, adhesives, embellishments etc and any of your latest purchases you haven’t yet used. You are welcome to also use any of my stamp sets, ink pads or punches, if you like. I will supply a seat, some lollies (to help with creative inspiration!) and coffee/tea/cold drinks. Book some time in your diary for YOU now and come along. Bookings essential (simply so I can organise table space for everyone). I’m planning on this night becoming a monthly or bi-monthly stamp & scrap night, so if you can’t make it this month, subscribe to my blog today and you’ll get an update in your Inbox when I update my blog for next month (the last Friday of the month is a possibility). Slot a place in your diary for YOU now … you deserve it.